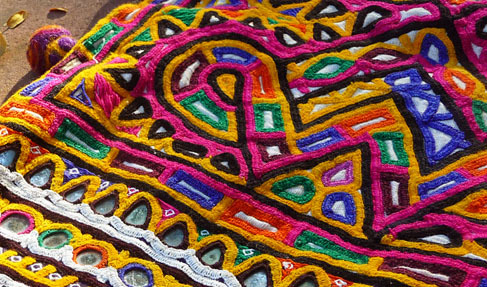 Gujarat is famous all over the world for its embroideries and mirrorwork. (ref. Kutch Embroidery, posted on 04 Feb 2010) There are about 16 different types of embroideries done in the Kutch region, but the most well known one, with its chain stitches and countless mirrors, is the Rabari embroidery. It gets its name from the Rabari community, who are a nomadic / semi-nomadic community of cattle raisers living in the western region of India, from Rajasthan to the Kutch region in Gujarat. They migrated into this region from Sindh (now in Pakistan) about400 years ago and many of their relatives still live there. They have wonderful stories about their origin, ranging from a connection with Shiva to Rajputs going outside their territories.Rabari, or “Rahabari” means one who lives outside or “goes out of the path”. 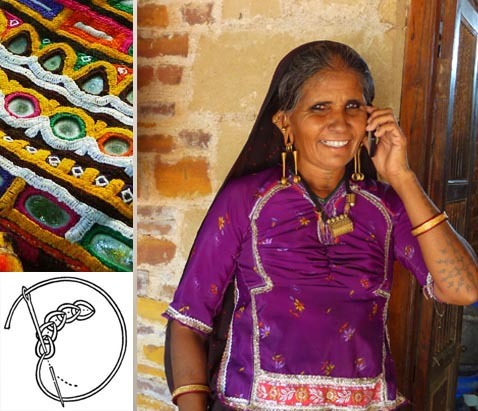 Among the Rabaris, the communities are further sub-divided into the Garasia, Kachela, Dhebaria and Wagadia of Kutch. 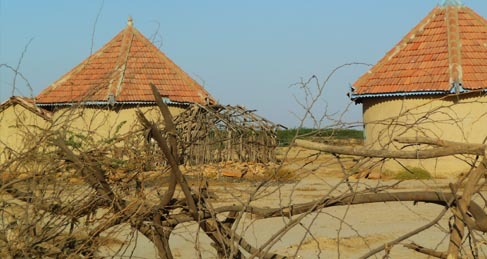 Many of the Rabaris live in circular huts, known as“Bhunga”. These have proven to be much resistant to earthquakes in the tremors that hit Kutch in 2001. Although a cattle rearing community, they also engage in embroidery. The men work with leather while the women embroider garments and accessories. 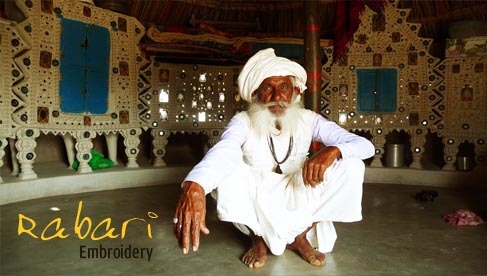 As the type of embroidery on the garment clearly distinguishes the person’s identity, the different communities of Rabaris can be identified from the type and placement of embroidery on their odhanis (veils for head and shoulders). For examples, the Wagadia Rabaris wear odhanis with embroidered borders while the Kachela Rabaris have designs in the centre of the odhanis. Rabari weddings are a colourful affair as any Indian wedding, but one of its aspects requires years of preparation. It is the preparation of dowry. The girl prepares her own dowry and only after it is ready she can go to her husband’s home. It may even take two or three years to prepare the trousseau which includes the girl’s clothes, bags, bedcovers and even the decorative camel cover. All of these are embroidered by the girl, and in this way, she also learns the skills which have passed on through generations. The men also wear embroidered clothes, the white pleated and embroidered kediyu being the most well known garment. Rabari embroidery is characterized by chain stitches and a generous use of mirrors. The women depict the world around them, without the help of sketches or patterns. 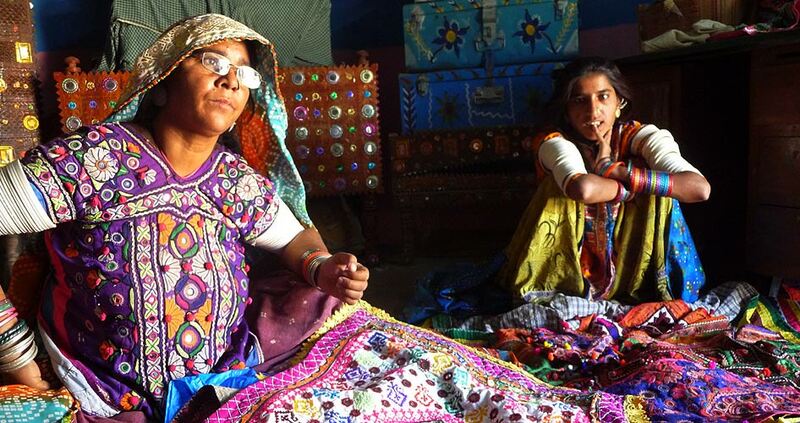 The only material used is a simple needle and thread, which they purchase from Bhuj, the nearby town. The stark landscape of Kutchh with its thorny babool and keekar bushes is given a new dimension with colours, by the vivid imagination of Rabari women, through chainstitches decorating the surface of cloth. May i please where can i buy these kutch emdroidery witj mirror work fabric? From where can I buy the fabric online. I would like to order men’s jackets. Pl. Let me know the price. Can you make jackets if we show a piece? Please send me your details to my mail. I would like to know where can I buy kutch and rabari embroidered fabrics by the yard online. Does gaatha sell them.